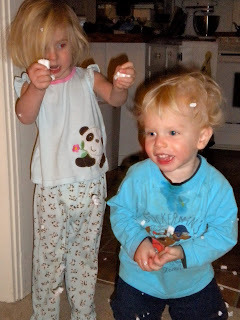 The kids found a bag of packing peanuts and had a blast. Caroline found them and had no idea what they were and then Tucker ran up and took a big handful out of the bag. Because of the static, the tiny white bits were all over them! When I tried to pick them up they just stuck to me, too. Tucker had white pieces all in his hair and Caroline decided that she liked that look and crumbled them and put them in her hair as well. I finally pulled out the vacuum and tried to get them up because it seemed as though they were multiplying! That did not even work that well. Most of the pieces are cleaned up, but I have a feeling we haven't seen the last of them!